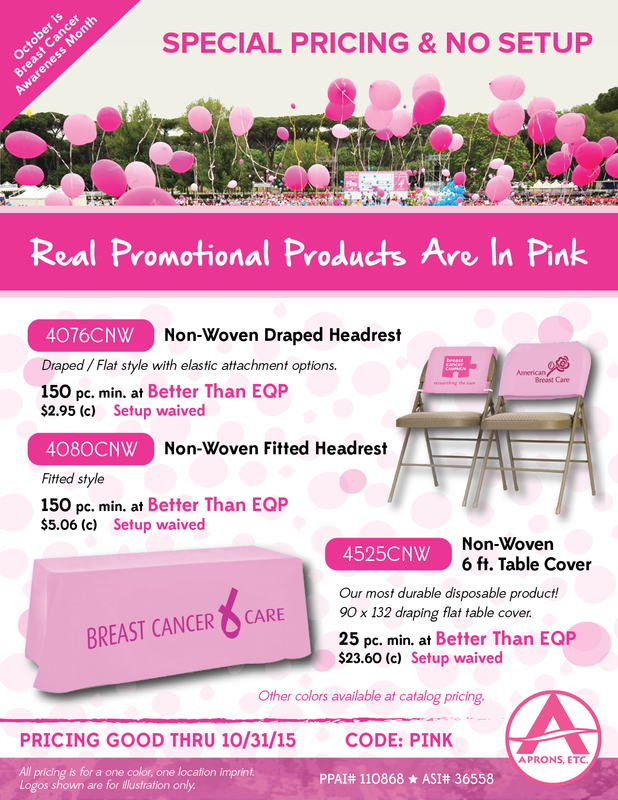 Special No Set-up & Better than EQP Pink Breast Cancer Awareness Promotional Products. All pricing shown is for 1/c one location imprint. Logos shown are for illustration only. Other colors available at catalog pricing. 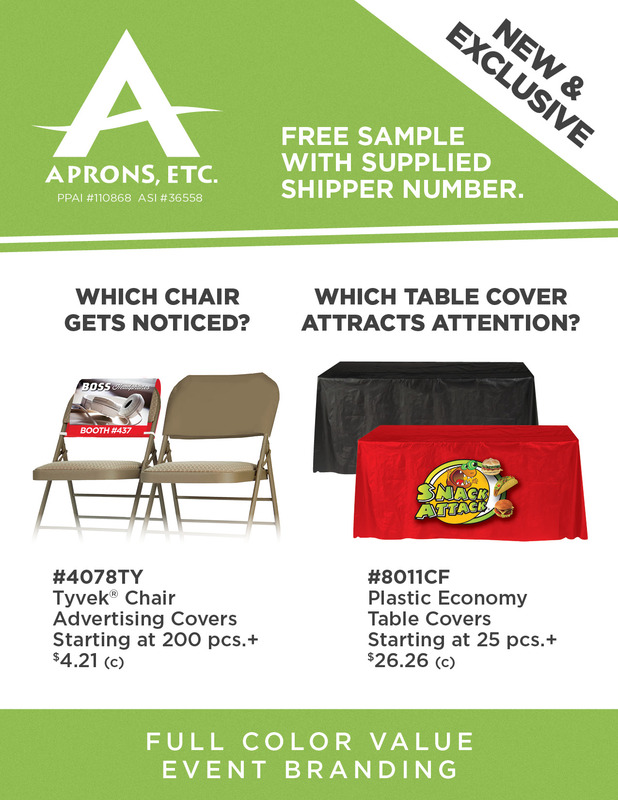 2015 New Exclusive Value Promotions, Displays & Uniform Catalogs by Aprons Etc. Our 2015 Virtual Catalogs are your link to traditional browsing in an easy online format. Our catalogs feature the most popular items from our Event Display & Uniform product lines. Aprons, Etc. offers over 30 years of manufacturing experience providing a diverse selection of quality American-made promotional products with professional and courteous 5-star service at a competitive price. Promotional products are available as blank goods, or with company imprinted logos via dye-sublimation, digital, or screen-printed embellishment. All products are suitable for promotional giveaways, trade show events, and public on-site company branding applications. Our products include; exclusive display table covers, banners, flags, event display accessories, aprons, smocks, vests, medical & restaurant chef uniforms, plus disposable & limited use promotions. ASI, PPAI & SAGE Distributor Partners order your FREE samples today with supplied UPS or Fed-Ex shipper number. 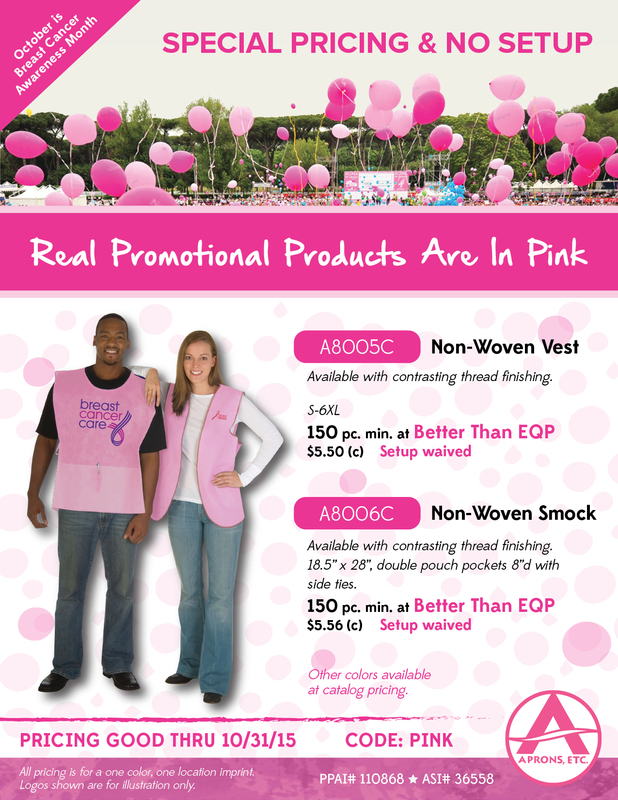 Real Promotional Products are in Pink! Special Distributor Pricing on Awareness Marketing Products.